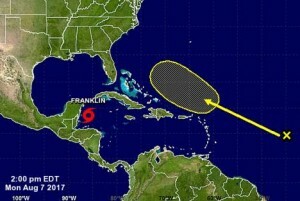 MIAMI - Tropical Storm Franklin formed in the northwest Caribbean late Sunday night and is expected to strengthen some more before landfall. A hurricane watch is in effect for the coast of Mexico from Chetumal to Punta Allen. A tropical storm warning is also in effect for Belize City northward to the border of Mexico and the coast of Mexico from Chetumal to Campeche. A tropical storm watch is in effect for the coast of Mexico from Campeche to Sabancuy. According to the National Hurricane Center (NHC) in Miami, at 5:00 pm EDT on Monday, the centre of Tropical Storm Franklin was located about 170 miles (270 km) east-northeast of Belize City and about 155 miles (255 km) east of Chetumal, Mexico, moving toward the northwest near 13 mph (20 km/h). A west-northwestward to westward motion is expected over the next 48 hours. On the forecast track, the centre will be near the east coast of the Yucatan Peninsula on Monday evening or night. Franklin is then expected to move across the Yucatan Peninsula on Tuesday, and into the Bay of Campeche Tuesday evening or Tuesday night. Maximum sustained winds are near 60 mph (95 km/h) with higher gusts. Some strengthening is expected before the center reaches the Yucatan Peninsula, and Franklin could be near hurricane intensity at landfall on the east coast of the Yucatan Peninsula. Tropical-storm-force winds extend outward up to 140 miles (220 km) from the centre. Rainfall amounts of 3 to 6 inches, with isolated amounts of around 12 inches, are possible across the Yucatan Peninsula of Mexico and Belize through Wednesday, with the highest amounts over the Mexican state of Quintana Roo. These rains could produce life-threatening flash floods. Hurricane conditions are possible in the hurricane watch area by Monday evening. Tropical storm conditions were expected to begin in portions of the warning area on Monday afternoon or evening. Tropical storm conditions are possible in the watch area in Mexico on Tuesday. A dangerous storm surge will raise water levels by as much as 2 to 4 feet above normal tide levels along the immediate coast near and to the north of where the centre makes landfall. Near the coast, the surge will be accompanied by large and destructive waves. Meanwhile, an elongated area of low pressure located about 1,000 miles east of the Lesser Antilles continues to produce disorganized showers and thunderstorms. Unfavourable environmental conditions should limit development of this system during the next few days, but some development is possible by the weekend. This system is expected to move generally west-northwestward across the tropical Atlantic at about 15 mph during the next several days.